all together – what a troop! Around 3,000 years ago, an intimidating Hebrew warrior called Benaiah, right-hand-man of King David and one of my ultimate biblical heroes, performed what the Bible calls “great exploits” (2 Samuel 23:20 & 1 Chronicles 11:22). One of these was that he “went down into a pit on a snowy day and killed a lion.” This feat, along with others in Benaiah’s resume (listed in the verses immediately after those quoted above), is not explained in any detail, although someone with a vivid imagination graphically described the scene in the 2017 novel, Succession Plan. We may well ask why the Bible contains records of such events. Perhaps it’s because, like all good writers, those who were inspired by the Holy Spirit to record such things knew their readers. Assuming that roughly 50% of Bible readers are men suggests that action as well as fact is required in the narrative. Benaiah’s life can be understood more completely by undertaking a study of the times in which he lived. David (particularly in his years as a fugitive) and his men were known to hang out at places like the cave of Adullam, the Crags of the Wild Goats and the Desert of Maon. These were men who knew how to survive and thrive in the wilderness for extended periods. In fact, it’s a common theme right through the Bible – men being summoned to the mountains or wild places in order to hear from God. Moses didn’t receive the Ten Commandments whilst sunbaking around the pool at a desert resort. He was called to Mount Sinai and ended up staying there for forty days and nights. He later sent some of his trusted men to check out Canaan for the same time period (that didn’t end so well in the short term). Elijah’s showdown with the prophets of Baal took place on Mount Carmel. Later, being pursued to the death, Elijah withdrew to a cave on a mountain where he would hear from God. Interestingly, it was quite possibly the same mountain (Sinai) for the same time frame (forty days) as that frequented by Moses. Jesus, of course, spent forty days in the wilderness where he was tempted to abandon his mission. Scripture tells us that he regularly retreated to the mountains or wilderness to spend time with his father. An event which clearly had a profound influence on Peter, James and John as witnesses was Jesus’ transfiguration (Matthew 17, Mark 9, Luke 9 & 2 Peter 1:16-18). At this time, Jesus led them up a “high mountain” – probably Mount Hermon, an imposing snow clad peak near the border of Israel and Lebanon and roughly 1.5 times the elevation of Mount Bogong! It seems there has always been an intriguing connection between wilderness experiences, men and their Creator. I wonder what God will do amongst a group of 13 men for 5 days on the spectacular Bogong High Plains? Our live tracker updates every 5 minutes during the days of our trek. We usually turn it on when we wake up and turn it off when we get to our campsite for the night. Due to variable conditions, sometimes the trackers signal doesn’t connect straight away so sometimes if you are looking, you may need to be patient. This tracker is going with Craig’s team, which leaves from Bogong Village. The tracker only shows the previous seven days data so if there is no data, the page might look like it isn’t working, again, be patient. Click here and the tracker page should open in a new window. You may have heard the expression “The weather on the Bogong High Plains has its own agenda” (Those who went on last year’s hike are probably rolling their eyes as they read this). The reason this quote keeps popping up is because it is so true. Consequently, the environment we will be hiking through demands that serious attention be paid to clothing needs. Essentially, being adequately clothed for a high country adventure requires three types of layers for the upper body. Next to the skin is the base or thermal layer. Merino or wool blend products are ideal for this. They insulate against both cold and heat and do not retain body odour like many other products (particularly polypropylene!) Many of us have found that a short sleeve merino T-shirt for hiking and a long sleeve version for night time use is ideal. Next is the insulation layer(s). Again, this can be merino, or some sort of fleece/wind stopper fabric. The number of layers of insulation required depends on the type of garment(s). Two lighter layers will give you more adaptability than one warm, bulky layer. Another option is a lightweight down vest or jumper. The final, outer layer is the shell. This consists of a waterproof jacket, and is arguably the most important article of clothing in your kit for a hike such as ours. Warning: if you were thinking of saving money by purchasing a cheap jacket of inferior quality, forget it. This hike demands a high quality jacket. Serious bushwalking rainwear has a number of specific features. Above all, make sure the garment is made from quality fabric and that it is seam sealed. Look at the inside to check that all the seams are taped securely; without this (or with an inferior version) the garment will likely leak badly in severe weather. As well as being waterproof, it needs to be breathable (at least to some degree), otherwise the slightest bit of exertion whilst wearing the jacket will bath you in sweat. The more breathable it is, the more you will pay for it! 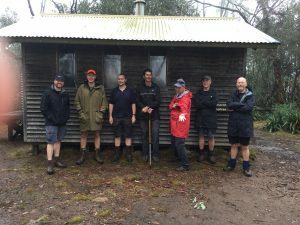 Typically, traditional bushwalking rain jackets are long both in body and arm length, to cover hips and hands when the weather is at its worst. They have a generous, adjustable hood and wrist cuffs, velcro closures to cover the zipper, a draw string waist to trap body heat when required and some extensive external pockets. Expect to pay at least $250 to get something of suitable quality. As a general rule, the further north you go from this price range, the greater the degree of breathability. Below the waist, layers are less numerous but still important. Many find walking in shorts is generally quite comfortable in autumn on the High Plains, with lightweight long pants for night time. “Zip-off” type hike pants are ideal – walk in shorts and zip the legs on when it gets cold. The real debate centres around the need for waterproof over-pants. While perhaps not essential, I would place them in the “highly desirable” category. In extremes of weather (cold, wet or windy), you will be glad you packed them. They do not need to be as expensive or high tech as the jacket in order to be effective. Some people ponder the need for thermals under the long pants. My advice would be to forget thermals and get a lightweight pair of over-pants to do the same job with more versatility. You might also have to factor in the quality of the hike pants. Whichever way you go, think twice before leaving the over-pants behind when heading to the Bogong High Plains. If you do go without them, make sure your hike pants are quick-drying. There are some other articles of clothing to consider. Make sure your undergarments are suitable and comfortable. Wear one pair of good quality hiking socks (Aldi merino?) and take one spare pair. Wear a sun hat/cap for hiking and have a lightweight beanie or similar to keep you warm at night. Gloves, also not essential, are worth thinking about. A lightweight, close fitting pair is probably more practical than bulky ski type gloves. My final pitch would be to try not to take more clothing than is necessary. But make sure the clothing you do take is up to the job. After all, “The weather on the Bogong …” – well … you know what I mean! Just for something different, I want to tell you all about my mate Rob. He is someone who I consider has all the necessary attributes of an outdoor adventurer (remembering that, in a previous blog, we’ve already established humility as the most important). Those of you who went on last years’ hike have met Rob. He and his wife, Wendy, provided us with some great support with our transport needs. It probably wouldn’t surprise you to learn that he is highly regarded in his local community. He is a man of faith, known for his service to others along with his humility, generosity, humour, work ethic and adventurous spirit. Rob is one of those people who is just fun to be with. That’s not to say he’s not annoying in some ways. He looks twenty years younger than he is and, like Paul, he can blitz you in carrying a pack up a mountain even when you think you might have the edge on him in training. He’s lean, strong, determined and fearless. He’s always up for a challenge. Invariably, he will have weekend plans for some sort of adventure, even though he’s toiled on the job (as a builder) all week. 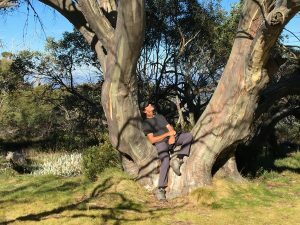 As a long-time local resident, Rob is intimately familiar with the Bogong High Plains. His knowledge and experience of the place is as good as there is. He’s probably forgotten more about this iconic location than what I’ve ever known. He lives and breathes this environment, hiking it in summer, skiing it in winter, four wheel driving or mountain biking it whenever there’s a chance. He does not, however, merely utilize the high country for his own purposes. He respects it. He understands the challenges, the impact of the terrain and weather, as well as the allure it holds for visitors. More than most, he is aware of how quickly plans can go astray. It is for this reason that he has a long history as a highly sought after (and successful) search and rescue volunteer. Rob has been involved in numerous such operations over the years. Though not all have ended well, many have bordered on legendary status. In the winter of 2004, an advance rescue party led by Rob pulled off a heroic rescue of three men trapped in a ferocious blizzard near the summit of Mt Bogong. Those three would almost certainly have perished if not for the team’s intervention. Appropriately, the rescuers were later recognised with a National Bravery Award. In 2014, Rob was instrumental in locating the bodies of two back country snowboarders tragically killed in an avalanche in one of Bogong’s remote gullies. Rob, of course, would never draw any attention to such exploits. If it did come up in conversation, he would merely deflect credit to others. That is why, apart from being a friend and peer, I also regard him as a hero. The high country is not just a nice place to go and visit. It’s a place where men can have experiences beyond the everyday, friendships can be deepened, respect can be earned and God can be encountered; particularly if it is approached with an attitude like Rob’s. If you are interested, you can read a short story called “The Rescue” – an account of Rob’s amazing rescue event – in a book called “A Chicken can make a Difference”. I have a copy. I also have an interesting newspaper article written about the event. If someone were to ask you “Are you training hard in preparation for the hike?” your answer may well be a resounding yes! With less than three months to go, we’re probably moving into a different phase in terms of stepping up our training. Which makes that second question all the more important. The intensity, or effort put in during the session. The distance of the hike. The weight in the pack. In regard to regularity, our target has been twice a week. Given that we are not professional athletes, it is probably unrealistic to expect much beyond this. The other four can, and should, be increased over an extended period of time. This is where the “train smart” aspect needs to be applied. It has been my observation that there has been a very significant emphasis on the “weight” component during this current hike campaign. We must remember that the purpose of training is to peak at the right time. There is no doubt that we need to train with heavy packs, up to 25kg as per the guidelines. But it is all about timing. If you are superman, you might be able to train year round with 20+ kg in your pack. Otherwise, you will need to consider the timing of your training. Carrying a heavy weight on your back is an unnatural action for a human. You must build up to it slowly and be careful about how long you remain in this rarefied air. It has been our position all along that preparing for this hike is an eight month process. Loading up with extreme weight throughout this time carries three risks. The first is injury. Carrying extreme weight places stress on the body, particularly if insufficient build-up time has been allowed. The more you load up and the earlier you do it, the greater the risk. The second risk is burn-out. This happens when extreme weight is applied too early and is carried for too long. The result is, in peaking too early, the participant is therefore on a downward trend by the time the hike finally comes around. In terms of the above list, there is a third risk; that being that too much weight too early leaves the participant battling to maintain their training and therefore unable to effectively increase things like intensity or taking on more challenging terrain. This means that the capacity to train harder as the hike approaches is actually diminished due to the challenge of simply maintaining the heavy weight. For these reasons, I submit that the “weight” variable may actually be the least important of the five (assuming that a minimum level is being adhered to and increased appropriately over time). “Am I training differently to what I was three months ago?” (Too much weight often results in an inability to increase the intensity). If you feel you’ve overdone the “weight” component, there’s no shame in backing off for a time to work on the others. If you’re on track, you should be well positioned now to step up other components. More hills, more intensity! While we’re talking about pack weight and training smart, let’s talk about the method of loading your pack. This requires some thought. If you merely open your pack and throw in bags of rice until it reaches the desired weight, you do your body no favours. Carrying the bulk of the weight at the bottom of the pack places more stress on the lower body, increasing wear and tear. You need to position it higher. Place lightweight material at the bottom and put the weight further up to ease the strain on your body. Likewise, try to get the packs centre of gravity as close to you as possible. Use the tension straps to pull the load in against your back, allowing you to walk in a more natural, upright position. Our first compulsory training hike is only a couple of weeks away. Here’s a heads up; the emphasis on that day will be on getting up Mt lofty as quickly as possible. It is not a competition to see who can carry the most weight. The minimum pack weight required for the day is 17kg. Go above that at your discretion, but be warned – the only thing of interest to Jonathan and I that day is how quickly we can all get up (and down) the hill. Set yourself a target body weight to begin the hike at. Something which is achievable and realistic. Of course, it will require some commitment. What body weight do you think you need to be to carry the pack with maximum comfort? What will you need to do to get there? Will you tell anyone else about your goal as a way to keep yourself accountable? Make a sacrifice. Perhaps you could give something up for a time, in order to be better prepared. It might involve a change in diet, or a change to your weekly routine to allow more time for training. You could make a personal commitment toward specific training venues or targets. Contribute something to the group – something which has benefit beyond that which you gain yourself. Take the lead on arranging a group training exercise or an overnight camp out. Put your hand up to help organise group requirements like the hike menu, first aid or transport arrangements. Put something on the website or run a social media campaign. Search the Bible for passages which speak of God’s creation and how we experience him in the wilderness. Scripture is full of examples of people who went into the wild places to be met by God. Compile a list. Share it. Gain inspiration. Here’s a favourite of mine to get you started – Amos 4:13. Commit to prayer. This is something we are often flippant about. Consider getting serious. Maybe you could liaise with a prayer partner or team. Consult other team members in regard to specific prayer needs. Prayer is potentially a powerful tool to enhance our preparation. So there you have it. Don’t feel pressure to have to do specific things, just be open to possibilities. Often we have to be intentional in order to get the best results. 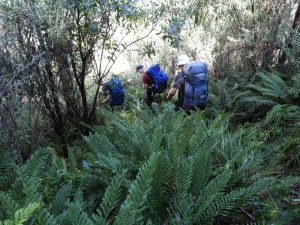 What is the most important quality for someone who aspires to complete a multi-day hike in a challenging place like the Bogong High Plains? It’s a good question, with many potential answers. All are legitimate contenders for the title. Fitness is obviously high on the list. Quite rightly, much of our energy is focused on the physical preparation which our hike demands. We train regularly, for many months, in order to equip ourselves. As we become fitter and stronger, our confidence increases. Self-belief – an important quality in itself – rises accordingly. Light weight camping and hiking demands good organisational skills, particularly in an environment like the High Plains. Even in the lead up, we need to be well equipped, having sourced appropriate gear which suits our purposes. This involves research and knowledge as well as the time commitment involved in putting a kit together. There is a need to load packs appropriately and operate efficiently on the trail and in camp. Our hikes are built firmly on the foundation of teamwork. Being a team player is extremely important. Operating in isolation simply doesn’t work. Even if it did, the participant would miss the rewards of being part of a team. High Plains hikers need to be resilient. Clearly, this applies in a physical sense. But it doesn’t hurt to have a thick skin either. Sometimes, amongst a group of mature men, things need to be said (in love) in order to get the best outcome. Then there are the obstacles. Last time around showed us clearly that things don’t always go to plan. This time, so far, we seem to be tracking well. But brace yourself! Challenges will come; if not in the lead up, then almost certainly on the hike itself. It is important to persevere through the tough times, seeking help as needed. I could go on and on … but let’s get back to the original question. Which of these qualities is most important? This may come as something of a surprise and will no doubt spark serious debate. But in the opinion of this hiker, the number one requirement comes from outside this list. I believe the most important quality for someone embarking on a hike such as ours is humility. I have spent a lot of time over many years on the Bogong High Plains. If I have learnt one thing it is this – NEVER, EVER underestimate the demands of this environment. We are undertaking a challenging task. Go to any website detailing the High Plains and you will find three common themes – notoriously unpredictable weather, challenging terrain and the need to be well prepared. The high country is spectacular and beautiful. Our hike will be an amazingly rewarding experience. But this place must be respected. Those of us who have been before face the threat of complacency. Do not assume that the next experience will be the same as your last. All of us would do well to clothe ourselves with humility (Colossians 3:12). Never think you’re on top of it. Don’t start telling yourself you’ve done enough or you’ll do it later. There is always more to learn, more to give and more to share. Seek advice. Be honest about your challenges. Expect to be tested, but do not fear the process. Be confident but not arrogant. Pray for each other. Offer support where you can. This is why being part of a team is such a rewarding experience. That which, individually, we might find quite daunting becomes so much more achievable in the company of others. Some thoughts to chew on, eh! I hope posts such as this might promote some further interesting discussion. Stay tuned for next month’s blog – 5 things to consider doing before the hike. Aim for 2 x pack walks per week for a minimum of 1 hour each. Aim for occasional longer (2-3 hour) walks as part of this program. Train at 25kg for around 3 weeks then back off for 1-2 weeks prior to the hike to let your body recover. Continue to train during this period, but only at an intensity which allows you to start the hike feeling fresh and ready to go. Aim for one before Christmas and one after. Aim to increase weight gradually rather than with a sudden large increase. 2 x pack walks per week is a minimum target. If you are doing other forms of training, these should be ‘as well as’, not ‘instead of’. Training targets are a guide. They are meant to serve you, not rule you. Listen to your body and train accordingly. Compulsory training sessions are exactly that – compulsory (barring an emergency). The aim is to have the entire group together for these sessions. Please make whatever arrangements are necessary to make this happen. If it is not possible, we will endeavour to change the dates, but not at short notice.